A dog is said to be man’s best friend. They are great companions and more importantly great hosts that invite you home enthusiastically after a tough day’s work. It can be equally painful to see them suffer from illness. One of the most common problems that dogs face is the dog flea. While you could go for immediate treatment with some chemicals and medicine, you should not forget alternative medicines. Dog aromatherapy is a great way of treating this problem. What lice is to humans is flea to dog. 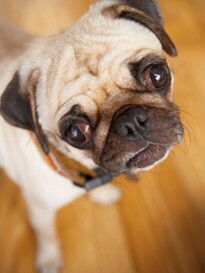 It is a terrible situation because that means, not only is your dog affected but also flea could soon be troubling you. The house would be filled with dog hair in no time due to constant scratching and this will not only be emotionally draining but also lot of efforts in cleaning and disinfecting the entire house. What needs to be done at that point is to find an effective- both time wise and cost wise - solution for this situation as quickly as possible. That is when aromatherapy comes into play. It is a natural way to beat the flea not only out of the animal but also out of house. The best part about the aromatherapy is that the treatment will not only cure the dog flea problems but also leave the house smelling great. So when you return back home you are not staring at the carpet and couch full of messy hair, but a great dog waiting for you in a scented house with soothing environment. Peppermint oils, lemon oil, eucalyptus oil and camphor oil work wonders for flea control. These oils are pungent and have a strong odor which drives the fleas away; besides they are fatal for the fleas too. 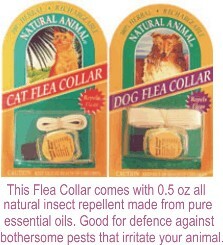 It is common misconception to expect fleas to fall off or “run away” once the dogs are applied with these oils. This aroma therapy is so effective that the fleas die on the spot and thus, cleaning up takes little time and efforts. Other oils that have been used for dog aromatherapy are bay and cedar wood. These oils can be mixed with dog shampoo and applied liberally on the fur coat. It is better if you use organic and mild herbal shampoo so that it will leaves natural plant based residues which repel fleas and ticks naturally. It is said that prevention is better than cure. A smart move would be to start applying the shampoo- oil mixture to the dog’s fur coat in seasons or at times when you fear that there might be flea infestation. Another way is to make a flea powder and dust onto the pet and work on the fur. To make a flea powder just blend 1/4 cup of baking soda and mix it with 1/2 teaspoon of orange essential oils. Plus put some essential oils like orange, citronella, cedarwood, eucalyptus, pennyroyal to your pet's collar. use it only a few drops and repeat weekly. This method is so good that it has acted effectively to keep the fleas at bay. Besides these generic solutions there are specialized dog aromatherapy products. Herbal Ear Rinse is a blend of essential oils used for cleansing the dogs ear. You need to take small amount of this on a cotton ball and wipe off the dirt, excess wax, etc from the dog’s ear. In conclusion, dog flea problems can be “naturally” controlled better – both in a healthy way and cost effective way. It does not cause allergies that might be an issue with artificial medications. These artificial medications might contain harmful chemicals which could produce adverse skin reactions like rash and pustules. Dog aromatherapy is natural, safe and very effective both as a cure as well as prevention.